Just when you think that maybe over 20 inches of snow on the ground might be enough, we are getting hit with another storm. We are in the 8-12 inch band at the current moment. It is supposes to start tonight late and snow all day tomorrow. I have my car pulled off of the driveway so that we can get plowed. My husbands car is still buried from the last storm. Since we are retired we don't need to get out. After church I stopped by the grocery store. It was very crowded but it was hard to tell why, it could just as easily have been the Super Bowl as the storm. I did notice that prices are higher on some things. The store roasted chicken was $1 more than usual and eggs for some reason are high. We have everything we need to survive including a generator just in case we lose power. Right now the sun is shining and it is hard to imagine that in 12 hours we will be getting hit with another storm but this is winter in New England. 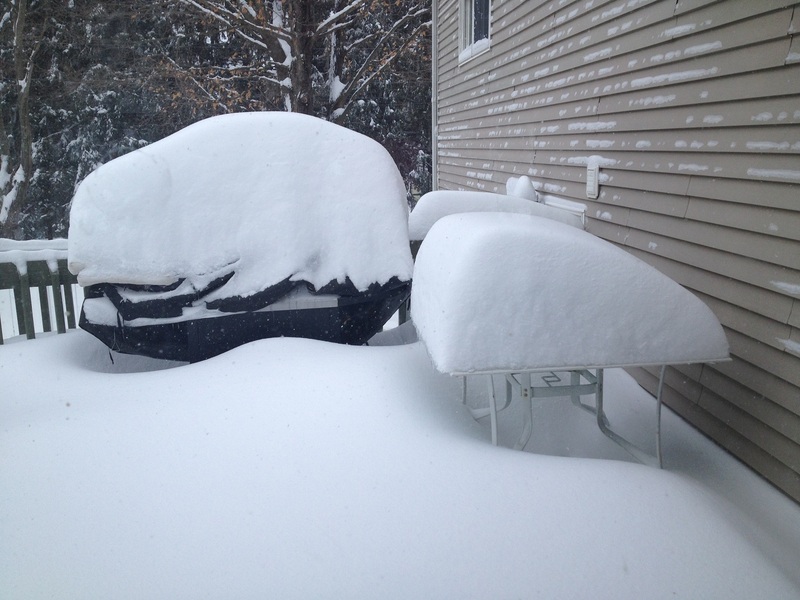 Photo credit: That is the snow on my deck and this is what we already have with more coming. Why did we rent our Florida House? There is certainly no shortage of snow there and I fully agree with you that you do not need any more. I hope you and your husband stay safe during all the wintry weather! Where I live, we don't get that much snow. If we get an inch to 3 inches in my town, it paralyzes the community. New England just cannot catch a break this winter. I hope that you will have time to dig out from this storm before you get dumped on again. Snow can be surprisingly heavy, so it is worth just wiping off the bulk to play safe. Yup. Another round. We are home from school tomorrow again. I kind of like these 4 day weeks. Stay warm and safe! I saw a clip on the news about price gouging as folks stock up before storms. One would think that the store that didn't get ugly this way would get all the business! I've never experienced anything like that in the photo. I wouldn't mind being amidst it for just once, but that would probably satisfy my curiosity. I don't mind snow. The cold temperatures, however... Well, I certainly wouldn't object to not having any more days for the rest of this winter with a high of less than 30.